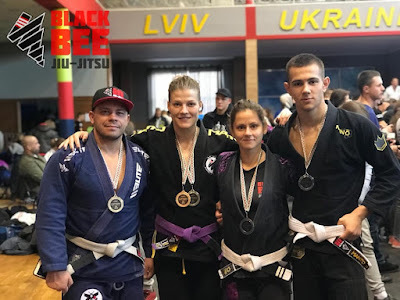 Jiu-jitsu.News: “Black Bee Jiu-Jitsu” team at Ukrainian championships! “Black Bee Jiu-Jitsu” team at Ukrainian championships! The “Black Bee Jiu-Jitsu” team has taken part in the Ukrainian jiu-jitsu championships. Sportsmen have participated in the “Lviv Open Jiu-Jitsu Championship 2018 GI” on the September 29. Fighters won 4 gold, 2 silver, 1 bronze medals and took the 3rd team place. The athletes also performed in the third stage of the “Ukraine National Challenge UFBJJ 2018” that was held in Lvov on September 30. The professional team got there 1 gold, 1 silver and 2 bronze medals.